I have a couple of friends who don't know how to swim and on different occasions, they've asked me to take private lessons with them since I am also not a strong swimmer (I can float, I can move around in the water but I'm still a little scared of the deep end). I did 1 private lesson this summer with Lisa and then another friend bugged me to go again. 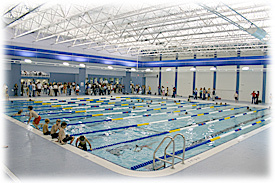 I didn't really want to sign up for more private lessons since it is expensive (even split between 2-3 people), so I signed up for an Adult Beginning swimming class at Triangle Aquatic Center thinking my two friends would also sign up. Well, neither showed up to the first class so I guess I will have to wait and see if they come on Wednesday! The training pool, we stayed on the 4ft-5ft depth side! The first class was me and 7 other people. For some reason, I didn't think about who else would show up but it still surprised me that it was 5 Indian guys, two white women in their 40s and myself (lone Pakistani, not yet 40!). It really shouldn't have surprised me since the Cary/Morrisville area has a high concentration of Indians and many are immigrants who never learned how to swim back in India. Three of the guys couldn't even float so they spent a good 45 minutes of the 1 hour class learning how to do that while the instructor worked with us on how to flutter kick (I got a calf cramp several times from trying to keep my feet in the right ballerina style position) and then learning how to do the back stroke. I learned to arch my back and focus on keeping my stomach up so I don't get water sucked up into my nose and mouth. I also learned that swimming makes me very tired. I was out of breath attempting to swim! I even asked the instructor if it was normal to be breathing so hard and she laughed and said swimming is a tough workout so yes, it was normal! Overall, it was a good re-introduction to swimming and I'm glad I signed up. I'm hoping by the end of the class, I'll be way more confident in swimming in deep water. Plus it will be something else I can do in the winter when it's too cold or rainy to bike. Saturday was all about mountain biking!